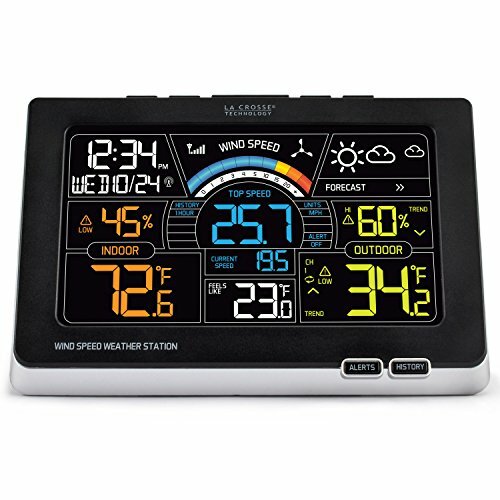 The La Crosse 327-1414W is a dynamic color weather station. It gives you an exceptional performance of its weather instruments and gives you accurate weather at a glance. It also monitors your indoor climate and your backyard conditions using a 3-in-1 combination sensor. This La Crosse unit records wind speed, outdoor temperature & humidity and transmits wirelessly within a range of over 300 feet. The outdoor sensor is used in tandem with an indoor display which comes with an included AC adapter. The indoor display unity may also be used with just battery power. One last highlight is that it has self-setting time & date and calendar to view and use as a daily guide in your life. Q. What are the dimensions of this weather station? Q. Does this system require the Internet to operate? Q. What frequency does this run at? Q Can this be plugged into a computer to upload data to Weather Underground? A. No, it can not do this. The AC power adapter cord is approximately 1.8 meters long which is 5.8 feet long. ❌ The outdoor sensor uses “C Cell” batteries, So this means it uses regular “C Cell” batteries. The shelf life in the outdoors is much shorter than indoors. Thus your batteries in the sensor will go dead quicker than Lithium batteries would. ❌ The possibility of temperature sensor giving a bad inside temperature reading. Reported up to 5 degrees too high. Could be from inside heat building up in the sensor housing which would give you an indoor temperature that is skewered higher than it should be. I will often look at the price and compare it to other similar products to see how they stack up together. In looking at this model from La Crosse it does look like the extra $14 is worth the extra bells and whistles you will be receiving compared to similar La Crosse models. I personally like the wind speed gauge that is front and center top on the display. Not only is the wind speed showing on a multi-colored wind speed gauge but right below it, it is shown as a large number that is easily picked out by my eye in quick glances at my station. Also with all other features on the screen there is much information you will be fed constantly so as to keep you up to date on the climate changes outside in your world. To me, the extra money is money well spent. I also have owned other La Crosse models and find what I own to be consistent operators and to be accurate in the readings they provide. I know some people have had problems but I find that the majority (actually over 80%) of the purchasers are very happy with La Crosse weather stations. I personally can vouch for the ease of set up, and maintenance in their stations. I believe this is a great buy for the middling weather person. What I mean is the casual weather observer will not use most of what is provided by the La Crosse 327-1414W Color weather station. But a person who has a good level of interest in weather will delight in all of the weather information that is provided by this unit. I would be excited to receive this station as a gift from a loved one. La Crosse is a trusted name in the daily home forecasting world. If you are a middle to professional level weather person, La Crosse products are on your radar. La Crosse Technology presents this forecast station 308-1425B. This station features expressive color forecast icons that change based on the weather conditions. It also monitors your indoor/outdoor temp & humidity. La Crosse Technology would like to introduce you to Tech Talk. A new video series designed to help you find the information you need to know quickly and conveniently. Feel free to leave comments with your questions or suggestions on how we can better serve you.